If I wasn’t totally enamored with the franchise after the release of Pokémon Red and Blue back in 1998, then when developer Game Freak released Pokémon Yellow a year later, I was completely captured. Nearly twenty years later, I was presented the opportunity to try my hand at the game’s forthcoming re-imagining, Pokémon Let’s Go, Pikachu! and Pokémon: Let’s Go, Eevee! at the Nintendo booth at E3. Taking the new Poké Ball Plus peripheral in hand, I was allowed to experience Kanto, the original Pokémon region, in a way I never imagined I would. I was immediately transported back to a time when I was first discovering Pokémon, before my relationship with the franchise had Bellossom-ed into what it is today. Sure, it was just a brief demo, but if first impressions are anything to go on, then Game Freak have masterfully crafted what appears to be a Pokémon game for everyone. For the veteran like myself, Pokémon: Let’s Go promises to be a new way to experience the Pokémon generation that started it all. For the newcomer, Let’s Go is a casual, approachable introduction to the series that may end up catching new trainers just like Yellow did me all those years ago. The E3 demo took place in a vibrant Viridian Forest, familiar terrain for old fans, though realized like never before in stunning high definition. 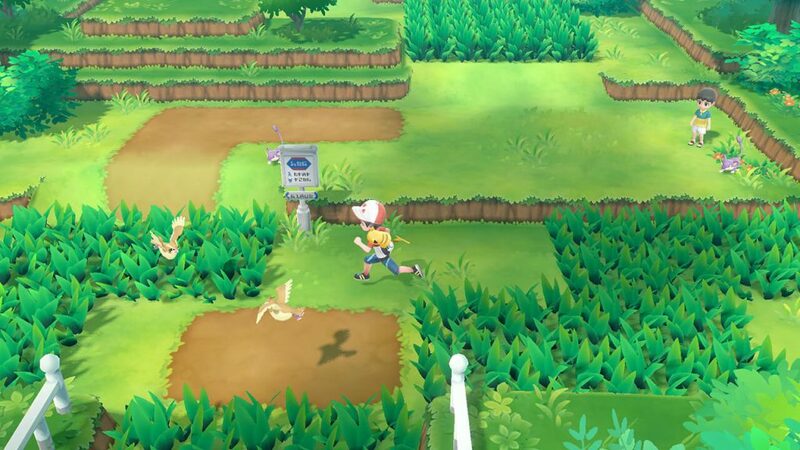 The forest is made even more lively by the presence of gorgeously rendered Pokémon on the map itself, wading through the tall grass and making the world feel lived in. Random encounters are absent, instead, the player can choose to engage with particular Pokémon on the map, or avoid them altogether. No need for a repel! Pokémon encounters don’t operate like the traditional RPG encounters where players must battle and weaken a Pokémon before they capture it. Instead, they operate like the more casual encounters from Pokémon GO. Utilizing the Switch’s motion controls, capturing Pokémon involves simply throwing a Poké Ball at a Pokémon. Strategy is limited to opting to feed the Pokémon a berry to make it more friendly toward you and maybe opting for a stronger ball type. Success is measured by accuracy, timing, and a little help from lady luck. Successfully catching a Pokémon not only means a new potential ally, but also rewards items and allots experience across a players active party of Pokémon, helping them learn, grow, and prepare for that next Pokémon battle. 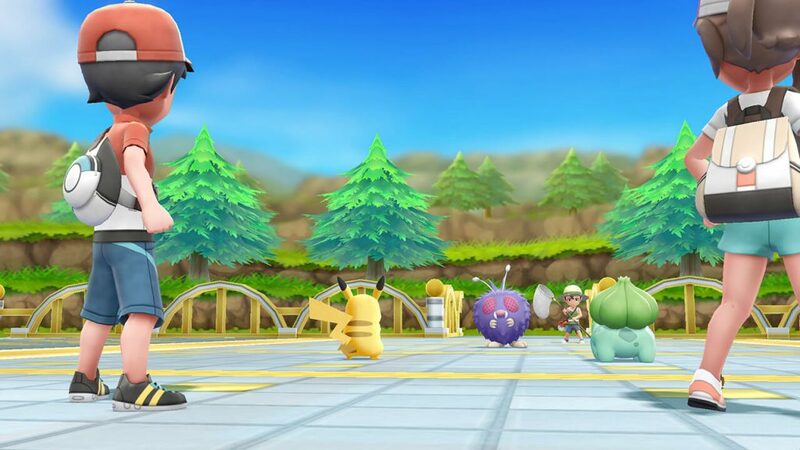 Training Pokémon might look different in Let’s Go, but trainer battles act exactly like they do in the core Pokémon games, suggesting that Game Freak is keeping some key components, like combat, consistent between Let’s Go and core RPGs. The rest of the experience, however, is a far more casual affair and comes off as incredibly relaxing and soothing, sensationally less like a strategy RPG and more akin to something like Animal Crossing. Encounters are quick and easy, menu navigation is fast and friendly, utilizing only two buttons, and traveling through tall grass has never felt so good since unwanted encounters can be entirely avoided and highly desirable Pokémon are found out in the open! Beyond that, the gameplay, particularly the capturing, is deeply satisfying and absolutely enhanced by the Poké Ball Plus and, presumably, the features offered by the Nintendo Switch Joy-Con controllers. Landing a perfect throw provides its own satisfaction, though it does take some getting used to. Using the motion controls, the game required less of a pitch and more of a direct flick in the direction of the Pokémon, similar to in Pokémon go, to ensure thrown Poké Balls didn’t miss their mark, resulting in some awkwardness at first that got more natural as the demo progressed. Underhand tosses and overhand lobs worked admirably as well, resulting in some “nice,” “great,” and “excellent” throws for me. More sensational is the HD rumble feature in the Poké Ball Plus, which rocked realistically as Pokémon settled in it, and produced the most satisfying click each and every time a Pokémon has caught, which I’m sure the Joy-Con are equally capable of creating, though admittedly without the full experience including light indicators and peripheral sound effects. Though not necessary, the Poké Ball Plus was surprisingly comfortable, and, even with nothing more than a joystick that doubles as an A button and only one other button on top, was more than capable of handling the game. The device also doubles as a Pokémon GO Plus, will allow players to carry their Pokémon outside of the game in some capacity similar Pokémon HeartGold and SoulSilver‘s Poké Walker, and even comes with the mythical Pokémon Mew as an added bonus. I will absolutely be buying on for myself. Pokémon Let’s Go might not be the traditional RPG seasoned veterans were looking for, but the “core” adjacent rethinking of the Kanto classic title isn’t trying to be. Instead, it’s trying to be a game for everyone. For the uninitiated, it’s an approachable introduction to a beloved franchise. For them and for everyone else, it’s simultaneously a new way to experience a treasured title and series. It’s an unexpected surprise of an experiment that I look forward to diving deeper into. As I held a physical Poké Ball in my hand that lit up, swiveled, and clicked simulating the presence of a Pokémon contained inside, I couldn’t contain the grin that immediately spread across my face. When you played it did it seem like there would be any option to play this without motion controls? Like, chucking the Pokeball with a button or something? I’m not that fussed about this game at all because I like the traditional Pokemon experience, but I might be tempted to give it a go as a nice little relaxing catch ’em up as long as I don’t have to use the Joy Cons. I’ve got to say I think I’ll miss battling wild pokemon, the GO approach takes away a lot of the challenge/sense of accomplishment for me… But then on the other hand, how much sense did it ever make to have us beat up the wild pokemon we wanted to befriend?